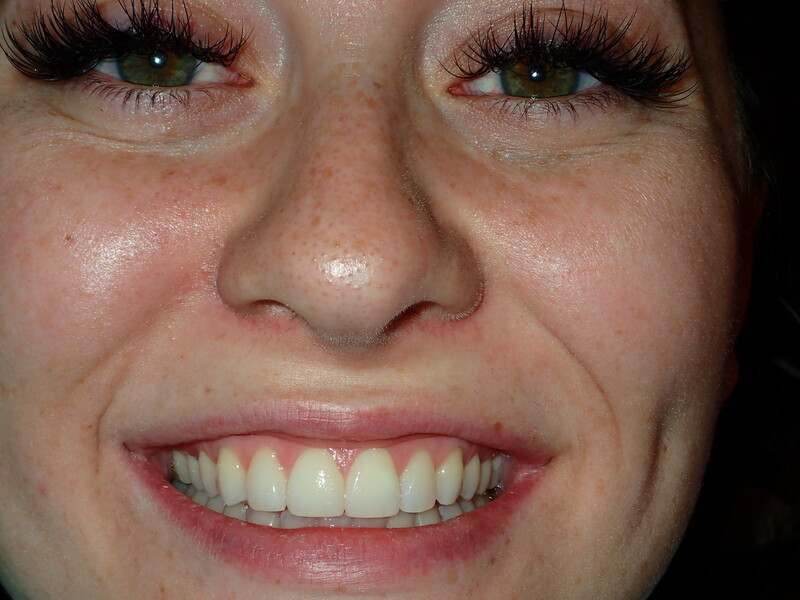 Wondering why your front tooth broke? 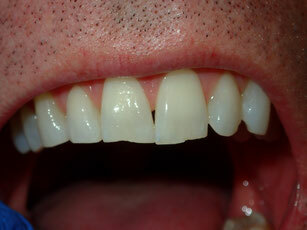 Here is a quick photo of a patient that broke his front tooth. He had a crown on the tooth, but when he bit down on a piece of licorice the tooth broke. This is a particularly difficult situation because there isn't much tooth left to hold a new crown. We ended up having to do a root canal and a post to help retain the new crown. Even after all that, if this lasts 5 years it is a success. For a longer term fix we could have extracted the root and placed an implant or a bridge here. 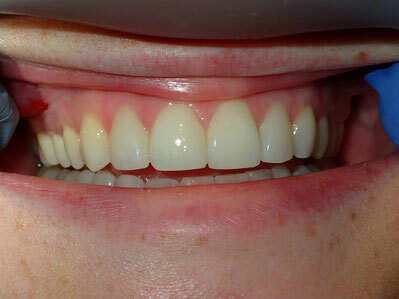 Replacing with a new crown was the least invasive (and least expensive) option at this time. That is what the patient wanted, so we did that. So what happened here? He bit down and pulled on licorice. When we bite AND PULL on our food (like licorice/candy or even worse JERKY) we put a force on the tooth that isn't in line with it's natural strength. Un-restored teeth can usually handle that kind of force, but a tooth that has been compromised may not be able to withstand the lateral force on the tooth. 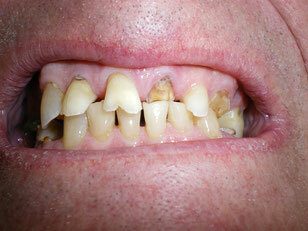 Anytime a tooth has been fixed (restored) it IS compromised. 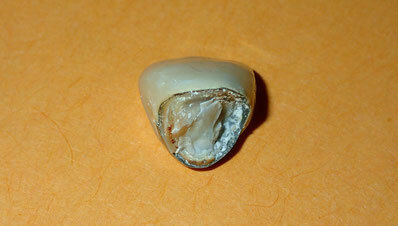 Here is a quick photo of a tooth that has broken off inside the crown. Honestly this is a bad situation. These just can't be bonding back on with any sort of predictability. I have patients that ask to "just glue it back on" and we will do that if they ask us to, but we tell them we cannot guarantee how long it will stay on. I think the average amount of time they stay on in these situation is 1-2 weeks. If your crown broke off, and this is what you see, you will most likely need to have the root of the tooth extracted and a bridge or implant. My tooth didn't have a crown, but it still broke off. I am wondering why? This patient came to us with these 2 broken teeth. His wife made him come in. He really wasn't too bothered by the appearance. So what happened here? His tooth was weakened by wear on the back side. Once it was weak (thin) enough a normal amount of force "snapped" the front of this tooth right off. His wear was from 2 sources. 1. Acid. 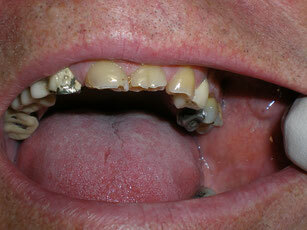 He has had years and years of acid reflux (often called GERD) that dissolved away the inside of his front teeth. This is very common in men (can occur in women too). Reflux is a silent assassin. Most people have no idea it is destroying their teeth. 2. Grinding his teeth. This patient does grind his teeth. Not as bad as some patients, but when combined with the acid reflux it was devastating. Fixing this is also very difficult (read a lot of time and money to get back to a nice result). I can't just put a white filling in there, it will require several steps to fix it. You may have been told you need a root canal by your dentist. Well, hopefully, I can provide some information on why root canals are necessary. I posted this ugly picture to help illustrate some points. I hope it doesn't scare anyone away. I will try to keep all this information short and sweet, but still provide some understanding. The last section below will address why you might need a root canal when you are not having any pain or problems with your tooth. It can be confusing. -Some types of tooth pain will not go away without a root canal. In these cases the nerve of the tooth is under assault. This assault is usually from a cavity that has reached the nerve (pulp) of the tooth, or a crack that has reached the nerve (pulp). In the picture I have posted we have BOTH. 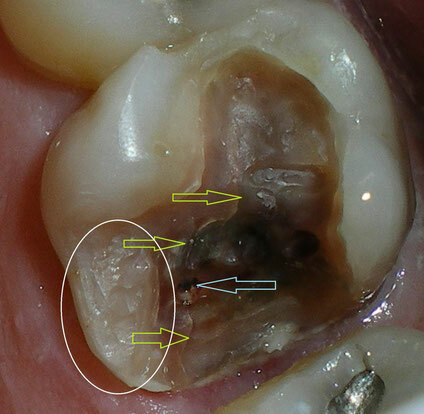 The yellow arrows show a crack that has reached the nerve, and the light blue arrow shows one spot (there are many here) that the decay has reached the nerve. There is actually a hole where the light blue arrow is. -If you have a cavity that is "deep" or close to the nerve there is a good chance you will need a root canal. This is especially true if the tooth has been sensitive to cold or biting. That sensitivity means the nerve has become involved. -If cold liquids, or cold air, make the tooth painful you will probably need a root canal. If this is happening don't wait until it is so painful you can't survive. Your tooth is trying to tell you something is wrong. It will blow up eventually, usually on a weekend or during a vacation. 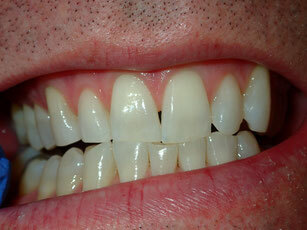 -If your tooth wakes you up at night and continues to throb you will most likely need a root canal. 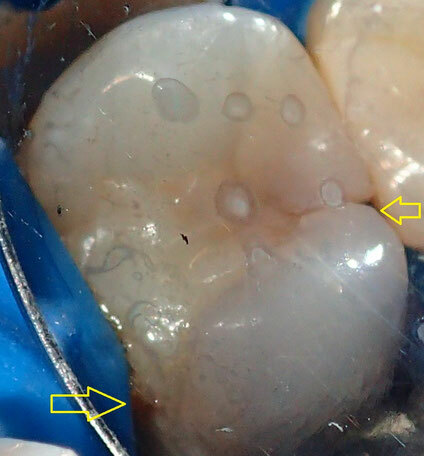 This tooth looks like it has a little broken corner on the filling (both yellow arrows). The patient was cold sensitive for a while, then all of a sudden.............BOOM! She was in severe pain. I'll show a picture of the tooth after I removed the old filling below. Sometimes a tooth will have a cavity reach the nerve and the patient will deal with the pain for a while and then it goes away. The patient is thinking "Finally, that tooth feels better". Then, with a little bit of time, the tooth blows up. 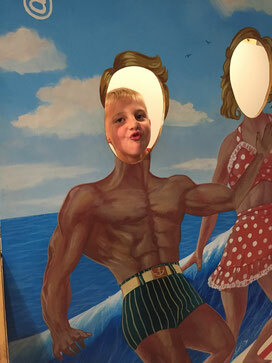 This time the patient's face swells up. What happened? When the pain went away the nerve (pulp) actually died. No nerve = no pain. 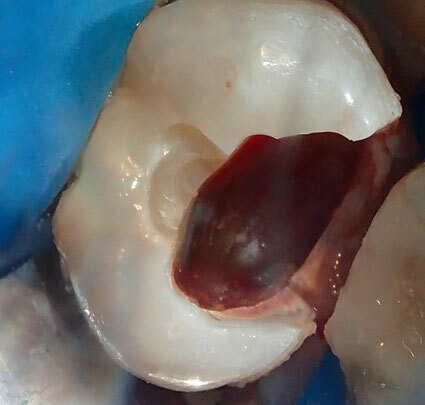 That dead tissue inside the tooth sat there until some bacteria made their way into the nerve. Once the bacteria found the dead tissue there was nothing there to stop them. They started devouring that dead tissue. Eventually they multiplied so many times they started to venture out of the tooth and into the bone and gums. That is why the patient swelled up. Also bone and gums have nerves, and they will fire when bacteria are infecting them. Antibiotics work better on these types of infections, but only temporarily. The only way to solve this problem is to get the dead tissue out of the tooth. That means root canal or extraction, both will get rid of the dead tissue. The more time a tooth spends with dead tissue in it, the less predictable a root canal will be. 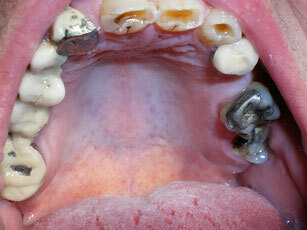 That is because the bacteria are moving into all the small, hard to reach areas of the tooth. All those areas have to be cleaned out during the root canal. Some are so small that only molecules of disinfectant can reach the area. It is much better to have the root canal done before the tooth becomes severely infected. The earlier the better. "But my tooth doesn't even hurt! 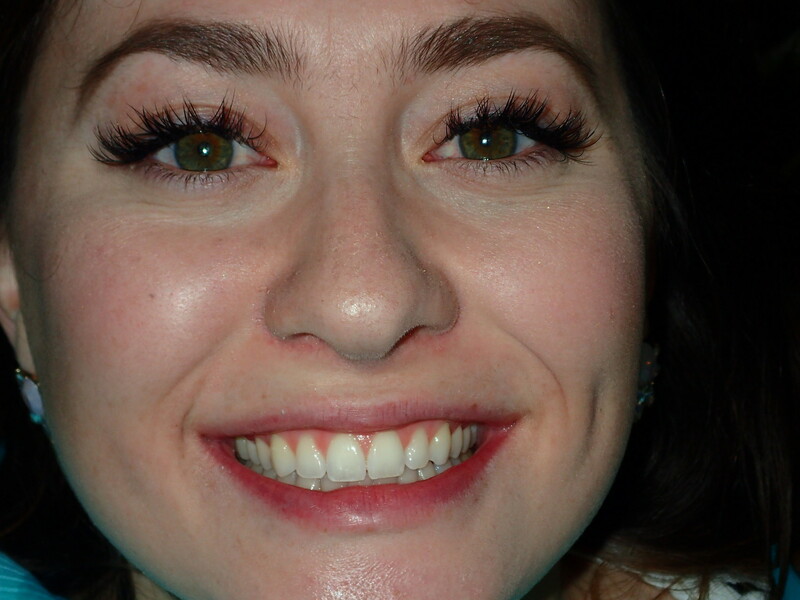 Why would I get a root canal when my tooth doesn't hurt?" I think this is the question most people have about root canals. There are quite a few reasons. I'll give you the 2 most common reasons. 1. The tooth is dead and abscessed, but it is draining. Your body can make a "pipeline" for the infection to drain outside the body. The exit shows up as a "pimple" on the gums. Sometimes on the roof of your mouth, sometimes on the outside. Sometimes it is draining into your sinus and you won't even see the pimple. The drainage keeps the area from building up pressure, so you don't swell and you don't hurt. The problem is eventually that drainage will get blocked, and it will hurt/swell. The dentist is just trying to get the tooth fixed before you have bigger problems. Also, you have an active infection in your body. That is not good for a lot of reasons I won't go into right now. 2. The tooth has a deep cavity in it that is very close to the nerve. I usually inform my patients that the cavity is too close to the nerve and I recommend a root canal in addition to the filling. If you remove the decay and fill the cavity (Without doing the Root Canal) your nerve will become irritated. It happens, a lot, that patients want to "try the filling and not do the root canal" in these situations. 9 times out of 10 the tooth becomes symptomatic and then you have to come back and get numb again and treat the tooth. Usually this all starts on a Friday afternoon. It makes for a long weekend. 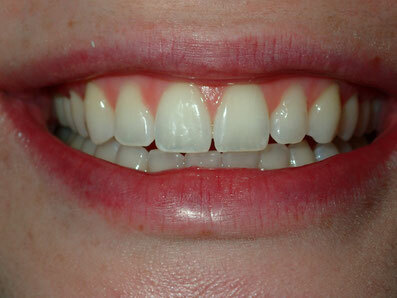 Experience has shown it is better to treat these teeth before they start hurting you badly. We know when the decay is just too close to the nerve, we see it every day.